EA Games president Frank Gibeau refused to say no. "We're not charging for this one, but I can't get into a hypothetical 'what we'll do next year or the year beyond,'" he told Eurogamer at E3. "But I can tell you for Battlefield 3 it's for free." Elite, set for launch alongside Call of Duty: Modern Warfare 3 this November, is a social networking and stat-tracking tool designed to enhance the online COD experience. It's free, but some features - yet to be announced - require a fee. Gamers have criticised Activision over the service. "Even haters can play for free," was the publisher's response. Battlefield's answer to Elite is Battlelog, announced during EA's E3 press conference this week. In what was a clear dig at Elite, EA said Battlelog will be "all 100 per cent free". "Battlelog drives player engagement," Gibeau continued. "It's super important to what you do with the service and the downloadable packs. "Right now, with Battlefield 3, we feel really good about offering that service for free and being able to bring in a lot of customers, get them to stay and find their friends. "That community dynamic is so important to what we try and do long term. That's how we're thinking about it right now. "With Need for Speed: Hot Pursuit we had Autolog. We saw a lot of great results. Customers were really happy with it. They loved it. They spent a hell of a lot more time online. "So bringing that over to Battlefield was mission one. That helped set up everything else." 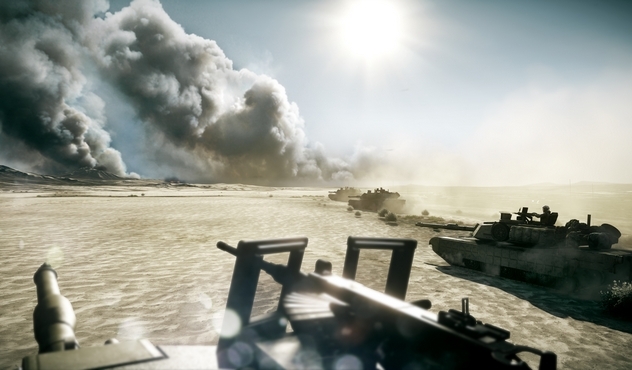 Battlefield 3 launches on 25th October. Modern Warfare 3 launches two weeks later on 8th November. There will be blood.